It’s not often that Ludum Dare creations travel further than their competition browser/download release. Yet Ballkeeper did just that fairly recently, and let me tell ya, this mobile port is every bit as awesome as the original (which I covered back in January). 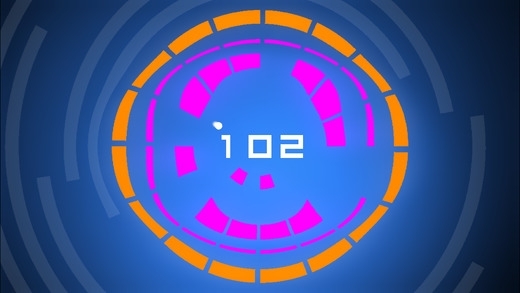 In case you’re not familiar with the game, imagine if someone mixed Breakout with Peggle… in a circular environment. Crazy? Probably, but it does make for quite the addictive experience, and one that iOS fans can now enjoy for free; no ads, IAPs or timers. Good stuff. So since it’s readily available on the web, albeit for Chrome users only, what’s the benefits to playing it on your iPhone, iPod Touch or iPad? Well, apart from being able to take it on the road, this version also features leaderboards via. Game Center and, quite frankly, it feels more natural on a touch-screen. Spinning that colorful circle to keep the ball from escaping does work with keyboard controls though, but it doesn’t have that same feel, ya know? And with three different control schemes – left/right side press, swipe and tilt – chances are at least one will suit ya. Personally, I prefer the first one, as it’s also how games like Super Hexagon and Pivvot are played; but as always, to each their own. Ballkeeper is available on iTunes (universal app), for devices running iOS 6.1 or later. Leaderboard functionality requires iOS 7, however.